It's the ultimate underground experience, but what exactly does Black Water Rafting entail? Tubing - yes, Rafts - No, the most fun you'll have in the dark? Definitely! It’s a weekend adventur​e like no other and an NZ bucket list must-do. 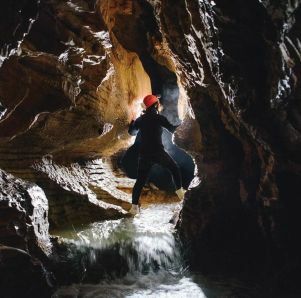 Heading 80 metres underground to explore one of New Zealand’s most diverse cave systems is a guaranteed way to get the heart racing. If you’re up for an adventure but vague on the details read on and get ready for Waitomo’s​ best thrills. The name of this unique adventure can cause confusion for the uninitiated. It is in the dark, there’s plenty of fast-flowing water, but no rafts are required! 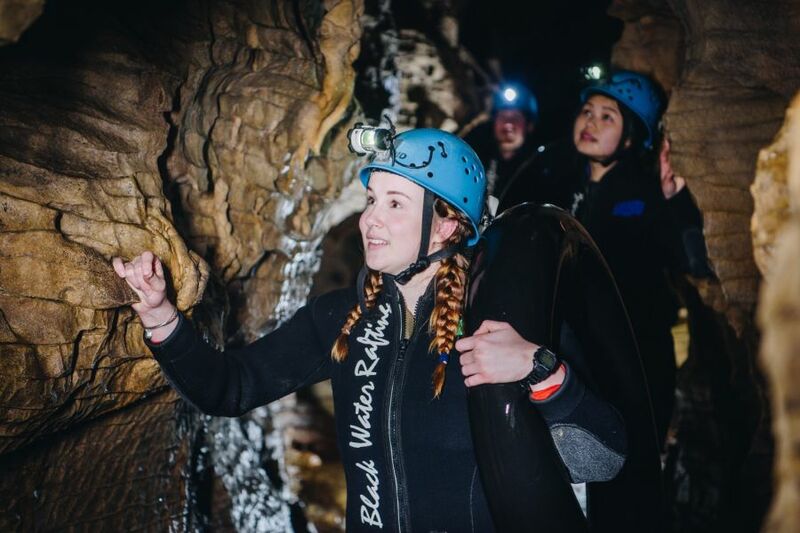 Taking its name from the leagues of white water rafting, the cave’s inky darkness replaces white water with ‘Black Water’ underground rapids​. The ‘rafting’ comes in the form of a rubber tubing ring. Getting you through the underground river’s tightest twists and turns, this circular ring will be your caving best friend. Whether leaping from heights or floating lazily under the glowworm-filled ceilings, it’s the indispensable caving device that our guides will get you mastering like a pro. Mix tubing adventure with cave exploration, waterfall climbing, plenty of fun diversions and you get an idea of what makes the experience so special. WHO IS BLACK WATER RAFTING FOR? While the adrenalin junkies are already half-way into their wetsuits, the less adventurous might be wondering what level of fitness is needed for something that sounds pretty extreme. No backing out here, the tours are suitable for all fitness levels and no prior caving experience is needed. Bring the energy and enthusiasm and our guides will handle the rest. There are two tours to choose from. Black Labyrinth - the original Black Water Rafting adventure and Black Abyss - for those seeking extra adrenaline thrills and maximum underground exploration. The only qualifier for both tours is age - 12 years old for the Black Labyrinth and over 16 years for the Black Abyss. Once you know what date you want to do the tour you’ll need to book online in advance. With a maximum of 8 people per tour on the Black Abyss and 12 people on the Black Labyrinth, places get snapped up quickly. Tours frequently sell-out before the day itself, especially during the summer season. Pre-caving prep is simple - the two key items bring with you are your togs or swimwear - to wear under the wetsuit, and a towel, for the all essential post-cave hot shower. Some cosy warm clothing for afterwards is a good idea too. Beanies, gloves and scarfs won’t go amiss if you’re coming during the frostier winter months! All the caving equipment you need to tackle to the caves is included in the tour. Upon arrival, you’ll get kitted out with a thick wetsuit and rubber boots. Not only perfect for caving photo-ops, but our gear also keeps you warm - even if the cave water temperature hovers at cool 10-14 degrees year-round. Top it off with a helmet and headlights and you’re ready to tackle all the cave throws at you. Once you’re here, kitted up and acquainted with your guides, you’ll quickly figure out you’re in good hands. Our guides are some of the friendliest and most passionate cavers around. They know Ruakuri like the back of their hand, mastering the art of getting to all the best parts of the cave while taking the most fun route possible. Between the briefing and the above-ground practice run, team bonding kicks off with the famously fun pre-caving photos. 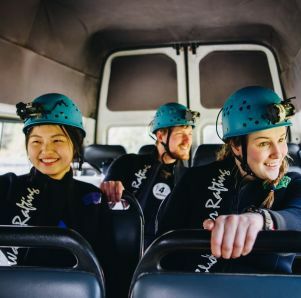 Snaps in stylish caving gear done, you’ll jump into the Black Water Rafting van and head a few kilometres down the road to Ruakuri Cave. Putting theory into practice, you’ll get rigged up on the high ropes if you’re on the Black Abyss tour. The 35m abseil into the caves is a whole lot less intimidating once you’ve got to grips with the basic rappel technique. For both tours, you’ll get to perfect the art of jumping into a river with the inner tube from (a not-too-high) height. Armed and ready, you’ll either be pumping with adrenaline or perhaps a little more apprehensive and ready to tackle everything that gets you a little shaky. The Black Abyss starts with the epic abseil down into the caves, while the Black Labyrinth takes you through a gap in the rock and straight into the underground waters. Tube on hand, get ready to slip and slide into some fast-flowing fun. Without revealing all surprises that await, zip lining, waterfall climbing and spectacular glowworm displays are amongst the highlights of this underground odyssey. Keeping you on your toes, the route covers some tight squeezes and tricky manoeuvres. Determination and expert advice from the guides will have you slipping through spaces you didn’t think possible. Amongst all of this, there’s also a midway break all important snack-stop. The guides have sweet treats on hand to keep the energy levels pumping right to the very end. Time flies even faster when you’re having fun underground. Tracing through the final stages of this elaborate underground maze you’ll burst back out into daylight. Clamber through a small gap in the cave walls and out into the lush native forest. With endorphin levels at an all-time high, the guides will get you back to the Black Water Rafting centre where it’s time to dry out, warm up and swap caving tales. Rounding out an epic adventure, hot showers, complimentary soup and a bagel are all ready and waiting for the perfect post-cave reviver. If you’re not ready to leave this subterranean wonderland right away, there’s a whole lot more that Waitomo has to offer. Check out one of New Zealand’s most renowned caves - on an easy, gentle walking tour. Or soak up the sunlight while exploring the numerous free walks and natural attractions hidden amongst Waitomo’s dense forest. If you’re ready to zip up that wetsuit, test out the tubing and descend underground, you can lock in your spot for the ultimate adventure here.